Most people feel that the on-screen reputation of Private Detective Matthew Scudder – crime author Lawrence Block’s most famous character – was tarnished by the little-seen but universally-despised Jeff Bridges vehicle 8 Million Ways To Die (seriously, it has a 0% rating on Rotten Tomatoes and everything). It’s understandable if that film deviated rather dramatically from the source material to a point where it became unrecognisable to fans of Block’s series of books, though this reviewer cannot fairly comment since he has neither read any of the novels nor seen that apparently infamous 80s train wreck. However, from what one hears about A Walk Among The Tombstones, a much grittier take on the character with Liam Neeson inhabiting Scudder’s skin, it’s much closer to what Block envisioned and is much more enthralling as a result. Gone is the Miami Vice-style cheese, replaced with a much darker and far more sinister crime story that resembles the filmography of William Friedkin more than it does any standard modern thriller. The Oscar-winning director of The Exorcist and The French Connection would sit in his seat in awe at this film’s desire to go the distance in showing its extreme tendency for violence, particularly an early sequence involving the grisly fate of the wife of Dan Steven’s drug trafficker. When both Stevens and the audience find out what became of her, it’s a method disturbing enough to belong in a deranged horror film. Even Eli Roth would squint his eyes at what he sees here. The violence doesn’t stop there; over the course of the film we see people getting shot, characters’ fingers being mutilated, throats being sliced and even breasts being (off-screen, thank goodness) sliced off. Though it’s far tamer than these descriptions may have you think, they are still pretty damn grim even for a crime thriller such as this one. The violence, whether you’re for or against it, helps to bring the story to a circular finish and thankfully plays a smaller part in the rest of the story. The focus is, of course, on its main character of Scudder, whom Neeson plays decently and serves as a great teaser of character arcs to come should this become a new film series. Neeson is given an entertaining character to play around with, preferring to use his words and brain to soften a situation rather than physical harm while at the same time keeping a balance between his former alcoholism and guilt of a past event where he was drunk on the job. Scudder is a compelling lead character for the audience to follow, and though some may be put off by the fact that his character has little to no personal stakes in the events that happen throughout – though you could argue that makes things much more realistic – he still has an important connection to the case and how it may or may not be solved. Also used to good measure, which in the hands of a lesser filmmaker would have come off as extremely corny and contrived, is the bond he establishes with a young street kid named TJ (Brian “Astro” Bradley, from the American incarnation of The X Factor), which manages to be heart-warming without becoming schmaltzy and proves to be the unlikely heart of the movie. Crime thriller fans will get a good load of material from the story as well, even its creepier and more blood-thirsty tendencies. Writer-director Scott Frank – whose last film on double duty was the underrated Joseph Gordon-Levitt thriller The Lookout – makes the interesting decision to set the film on the cusp of the new Millennium, at a time when Y2K fears were becoming more and more prominent. “People are afraid of the wrong things,” a character decides, and they’re not entirely wrong even when you see who says that line. There’s an eerie connection between the events transpiring over this film’s running time and the everyday fears that people were thinking of in the year 1999 – of course, the Y2K stuff was just a storm in a teacup and a great big fuss over nothing; likewise, the characters who would otherwise be the villains in a lesser movie – a group of drug traffickers (including Stevens), a junkie and a Eastern European mobster – actually turn out to be on Scudder’s side against the creepy duo of serial killers who are after their families. Initially, we are/were afraid of both these elements but soon realise/d that there was no reason to be scared in the first place. The film manages to (mostly) avoid cliché by NOT having these people turn out to be against our lawful protagonist but instead be the closest they can be to good guys despite their dodgy statuses. “Afraid of the wrong things,” indeed. 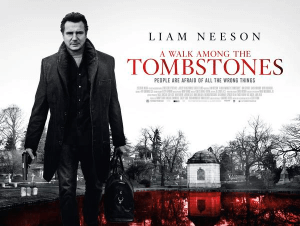 In closing, perhaps the best way to summarise the viewing experience of A Walk Among The Tombstones is that if you desire an entertaining and pulpy crime thriller then you’re going to get your money’s worth. It’s decently made, it’s decently acted, we’d say it’s a pretty decent film of the genre to check out, if you’re into that kind of stuff. Oh, and for the Taken crowd, Neeson DOES talk to a kidnapper on the phone. You’re welcome.